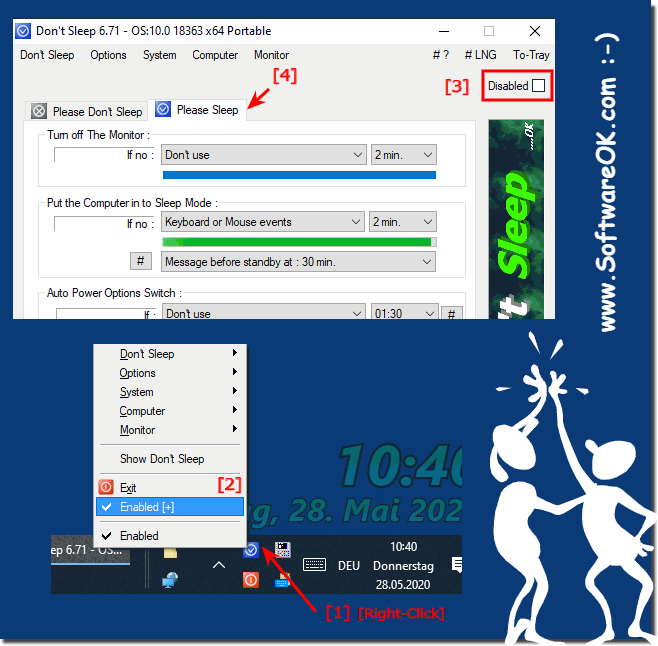 Please Sleep in Dont Sleep can be deactivated quite simply, via Windows To-Tray (info-area of the Task-Bar) or in the program itself! In Please Sleep mode is the Don't-Sleep mode disabled and vice versa. When deactivated, of course, both are deactivated. Please use ... always the latest version of Don't Sleep! (Image-1) Disable Please Sleep in Don't Sleep! As you can see above in Windows 7 shot screenshot, you can easily disable the Please-Sleep in DontSleep, so is no longer automatically turned off the screen or put the computer in the idle moments, you can easily and without hesitation use this example. It does not matter if you want to put the computer on hold on to prevent from sleep on earlier versions of Microsoft's Windows operating systems or under new MS OS 10. Regardless of whether it's hibernation on the Windows desktop computer, too fast standby mode while tweeting or Facebooking on the tablet PC or Surface Pro / Go, or even on a Business Server operating system. It is a simple yet effective tool to affect hibernation and really makes good use of these enhanced power features, whether on the new MS Windows OS, or on one of the older MS OS, it has been tested at all and successfully verified. DontSleep - FAQ-12: Disable Please Sleep in Don't Sleep?